Applications for planning permission are decided upon by taking into account of the local development plan, made by Local Planning Authorities (in our area Stoke-on-Trent City Council working in partnership with Newcastle-under-Lyme Borough Council) and The National Planning Policy Framework adopted by national government. These must be taken into account when preparing local and neighbourhood plans. A development plan details planning strategies and policies for the future development of the local area. They are drawn up by the council in consultation with the community. They are also known as 'Local Plans'. The current development plan includes the Core Spatial Strategy (2009) and saved policies. 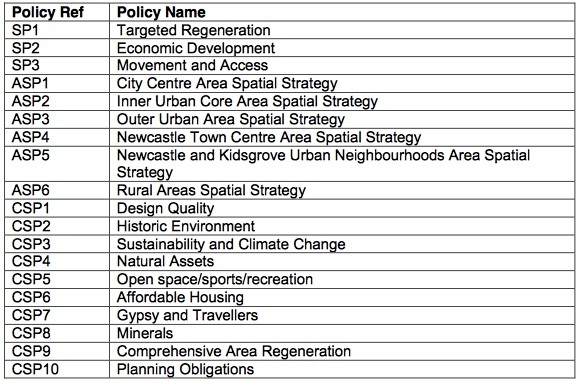 The City Council has produced a useful composite list of development plan policies that are currently used in the determination of development proposals which can be found here. The supporting evidence for these policies can be found here. These provide additional detailed guidance to explain policies and proposals. SPDs covering Stoke-on-Trent include: Affordable Housing; Inclusive Design; Urban Design Guidance; Sustainability and Climate Change; and Healthy Urban Planning. Links to the various documents can be found here. Some policy documents apply to specific areas within the city, including consevation areas - details of which can be found on the Potteries Heritage Society website here. Further documents will be of interest to those concerned with the built enveironment or undertaking a neighbourhood plan. These include Stoke-on-Trent Retail and Leisure Study and the Joint Waste Local Plan.